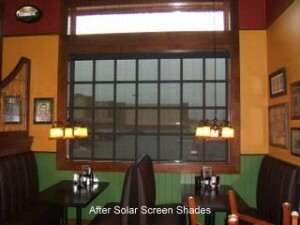 Solar screen shades are designed to control light or sunlight without eliminating it. It’s kind of like, sunglasses for your windows. 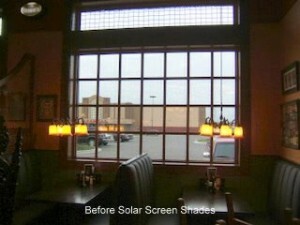 Solar screen shades reduce glare while allowing excellent views to the outside. You’ve seen these type of shades in many of the local restaurants in and around Lexington, KY. From Starbucks, Chick-fil-A, Carrabba’s, Cracker Barrel, Panera Bread, The Pub, and the list goes on. You get an open view of the outdoors but yet still retain some privacy as well. Solar screen shades aid in conserving energy, controlling heat and glare, increasing thermal comfort while maintaining a view to the outdoors. The opacity of the fabrics range from 1% (which is almost a blackout shade) to 30% open factor. Solid colors to pattern fabrics are available. Depending on what you want to accomplish, your choice of fabric will determine your next course of action. Our fabricators, Insolroll, Hunter Douglas, and Lafayette have selections in this group. Exterior shades are available for patio applications in both manual and motorized configurations. You’ll find that with this application, you’ll be adding another room that you’ll utilize for fun and fashion. Motorized or remote controlled shades are available in select products. 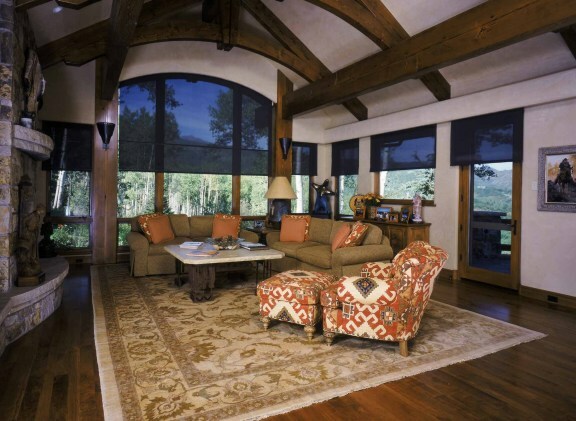 Do you have a wide span of windows (up to 120″) that you’d like to keep open and enjoy the view. Solar screen shades could be a great option for this area.